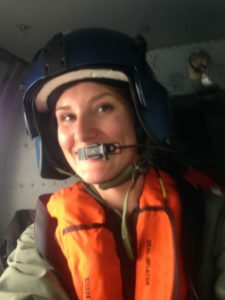 JL Boston Celebrates Our Veterans: Spotlight on Anna Hart, US Coast Guard Commanding Officer and JL Boston Member! - The Junior League of Boston, Inc. In honor of Veteran’s Day today, this month’s member spotlight is Anna Hart- Junior League member since 2012 and US Coast Guard Commanding Officer. Read below to learn more about one of our incredible members who serves both her country and community in amazing ways! Today of all days, JL Boston thanks Anna and all our Veteran members, as well as Veteran’s everywhere, for their service! What inspired you to join the US Coast Guard in 2004? You became a Commanding Officer this year! What is your experience as a woman leader in the military? As a Commanding Officer, I am in charge of over a million dollars worth of assets, have the privilege to lead and serve with dedicated service men and woman , and I know that every day I get to make a difference…it is AWESOME! The Coast Guard is a wonderful military service that has always valued women and has been way ahead of the curb when it comes to supporting its members regardless of gender. My gender has never limited to opportunities within the Coast Guard. There are obvious struggles, choices, and balances that my male colleagues don’t necessarily have to consider, but I believe I would be faced with many of those same choices regardless of my profession. I feel truly honored to serve my country. How did you first get involved with the Junior League? One element of military life is that about every 2-4 years, I transfer to a new job which for me as always meant transferring to a different state. I have been station in DC, Texas, FL, Boston, CT, and now back to Boston. Through all those moves, I found that I was lacking a sense of community connection and a social network outside work. I joined the Junior League in 2010 in Pensacola, FL. Like many women in the League, I had several friends who had joined and shared how much fulfillment they received from serving in their community and working with such talented woman. All those things interested me as well as being part of an organization that I could be a part of regardless of where I transferred. I have now transferred multiple times– twice to JLB and once to JL Rhode Island. The JLB has allowed me to instantly be connected to the community in a way that no other organization could provide. I am so grateful for all the support and friendships that are a result from being part of JL. 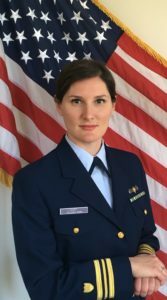 How has your experience as a woman serving her country in the Coast Guard compared/related to your experience as a JL Boston member serving her community? Speaking with my female colleagues I find that our values for joining the Coast Guard are very similar to those values of joining JLB: service, leadership opportunities, and a sense of community. It is a natural fit. When I transferred to JLB in 2012, the first person from the JLB to reach out to me was Christian Sullivan as part of the transfer committee. 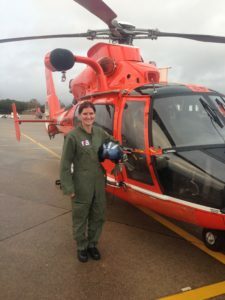 Christian, who transferred to JL Seattle this summer, is also an officer in the Coast Guard. Neither one of us knew each other before and only discovered our professional connection after we spoke on the phone. There are many women who are like me, serve their country and their community by being part of Junior Leagues throughout the country. I take pride in the fact that I have helped influence several very talented women into joining the League here in Boston and in Virginia. Do you have a mentor and/or have you ever been a mentor? I have been blessed to have many mentors over my career and personal life. I think it is an important element in growing as a leader. I encourage others to have at least one mentor that has nothing to do with your profession; diversity of thought and experiences can only make a person stronger. I hope I am a mentor for others. I try to always keep an open door, ask engaging questions, and provide an environment that people feel empowered to develop into their best version of themselves. What would you tell someone who is thinking about joining the League? DO IT! The leadership and opportunity to connect and serve the community is something you cannot receive in any other volunteer organization. Lastly, what is your favorite thing about New England? I really love that there are 4 seasons! Spending most of my life in the south, I grew up with more like 2ish seasons…hot and not so hot. I LOVE hot weather, but enjoy that each season brings it new activities to do.